AP Touring Co. (APT), founded in 1927, is a Melbourne-based, family-owned and -operated travel company. In addition to its river cruise partnership with AmaWaterways, APT offers ocean, expedition and river cruising; coach travel; rail travel; four-wheel drive adventures; air safaris and short breaks. The company got its start when founder Bill McGeary responded to a Melbourne tram strike by building a bus onto a truck body to provide transportation. His son Geoff, who still helms APT, pioneered contemporary travel styles in Australia in the 1960s and 1970s by greatly expanding acquisitions and growth into a variety of travel sectors. Today, the McGeary family's third generation is now contributing to the operation of APT. Among the travel companies it owns are APT Kimberley Wilderness Adventures; Travelmarvel for affordable cruise and coach tours in Australia; New Zealand and beyond to Egypt, Asia, Alaska and Europe; and Botanica World Discoveries for garden-themed tours and river cruises. It also owns Captain's Choice, for deluxe and bespoke trips; Croydon Travel, a retail agency that also offers sightseeing flights over Antarctica; and Topdeck Tours, for 30-something travellers who want to see Europe. The company primarily markets its trips to travellers from Australia, New Zealand and the U.K. 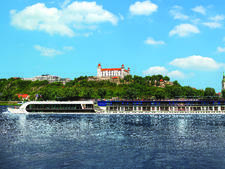 In the European river cruise arena, APT is best known for its partial ownership of AmaWaterways. Working with AmaWaterways, APT offers two different types of river cruise experiences to its travellers from Australia, New Zealand and the U.K. 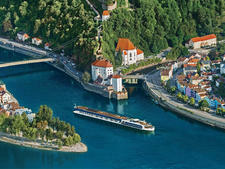 The first, called The Royal Collection, features APT-specific inclusions and enhancements on select AmaWaterways vessels. These include a specially designated APT tour director or cruise director, APT Signature Experiences (often-exclusive sightseeing experiences, such as a tour of a private castle) and complimentary open bar. Luxury land journeys pre- and post-cruise, tipping, porterage and transfers are all included in cruise fares. The second choice for APT's customers is simply to book on any of AmaWaterways' other ships, but these cruises won't have all the same bells and whistles. All of the cruises APT sells in mainstream Europe take place onboard AmaWaterways ships, and as such, they hew to certain standards. These include ambitious regional cuisine, well-designed cabins and guided port stops (most included in the fares). APT's sailings are on ships featuring amenities like in-cabin multifunction TV/Internet setups, elevators and mechanized wheelhouses that can be lowered to transit under bridges. Ships in the fleet tend to represent standard riverboat design and layout, with two lounges -- a large main lounge at the bow and a more intimate lounge located aft -- that offer panoramic views of Europe, as well as expansive sun decks with plenty of loungers. Public areas offer free Wi-Fi, and all cabins have "infotainment" setups (basically flat-screen TVs with Internet access), movie and music libraries, and bow and navigational cams. Eighty-two percent of cabins feature French balconies. Newer debuts feature a unique-to-the-industry design in which cabins have two balconies. One's a French verandah with floor-to-ceiling windows that open, and the other is a true, step-out balcony with a pair of tables and a chair. These ships are also home to the Erlebnis restaurant, using the traditional aft-lounge area to create an alternative venue, complete with glassed-in chef's kitchen. Every ship is nonsmoking (except on the sun deck) and features a beauty salon and massage therapist. Unlimited local wines, as well as beer and soda, are included with each open-seating lunch and dinner, which consists of indulgent regional cuisine with special selections from local European ports. 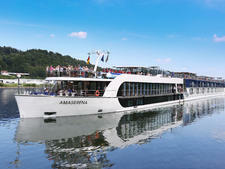 AmaWaterways' ships are staffed by international crewmembers. The majority of workers onboard are Hungarian, Romanian and Slovakian, and all speak English. Additionally, there's a knowledgeable cruise director on each sailing to lead shore excursions, arrange for airport transportation and offer running commentary during scenic cruising. Daily sightseeing programs are included with each cruise, and tours include wireless audio devices so cruisers don't miss a word on history or culture. All ships offer roughly 20 bicycles that passengers can use to explore ports. Entertainment is focused on local customs and culture; performances by European dancers or an orchestral group keep passengers occupied in the evenings. There are also some more down-to-earth offerings, such as an always-entertaining crew talent show and wacky trivia night. You'll sail with a well-travelled, somewhat affluent older crowd, mostly from Australia, New Zealand and England. Passengers tend to have a casual style and enjoy a bit of social mixing. Leave your foreign phrasebook at home -- until you get off the ship. 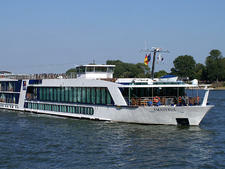 APT offers The Royal Collection trips on several of AmaWaterways' ships. 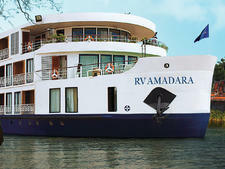 For sailings beyond Europe, the company offers cruises on riverboats and ships that it charters from other companies. In China's Yangtze, it's the Sanctuary Yangzi Explorer. In the Mekong, APT markets AmaWaterways' AmaLotus. Via Noble Caledonia, Caledonian Sky sails cruises to Antarctica, and its Island Sky is another luxury small-ship option. For soft adventure cruises, APT works with Compagnie du Ponant's L'Austral and Le Soleal, along with Delfin II in the Amazon, La Pinta in the Galapagos and Australis in Patagonia. In heartland America, APT works with American Cruise Line's Queen of the Mississippi, and in Alaska, APT travellers have a choice between Princess Cruises and Holland America Line. Anastasia, the line's first solely-owned and -operated ship, will have five dining locations onboard, including Indochine, an effort by Sydney celebrity chef Luke Nguyen that will feature a French-Vietnamese fusion menu. Also available will be Zhivago's Chef's Table Restaurant, the informal Cafe Volga, Louisa & Roberto's Italian Restaurant, and the Tsar's Caviar and Champagne Bar. Other features on the list are a sun deck with an ice cream bar, a heated pool and two whirlpools. The Anastasia Spa, the Hermitage Lounge and Bar, and a 24-hour tea and coffee bar are other amenities. Seventy percent of cabins will have balconies.